According to ForbesXiaomi continues its expansion with official launches. Within a few days he will be in the UK. I expect the day she will officially enter the US market. If in the previous article we talked about a Xiaomi branded smartphone addressed to those with lower technological claims, we are now discussing the opposite. The expectations of the UK from Xiaomi Mi Mix 3 are quite high. They have whom to compare. I know how to identify and analyze them. They can accurately evaluate their price compared to other products with near-run performance. It’s a challenge. A challenge that Xiaomi is willing to assume. I recommend the Forbes article. He surprises expectations in fine shades. As I told you a little earlier, this launch is an important step towards the big launch in the US. Let’s not forget that there are many similarities between the UK and US smart markets. I could say that this launch is a test for the great launch. Decisive is the availability of locals to buy a product at a lower price. Is the high price of a product the only proof that it is also quality? Xiaomi phones are available through various stockists in the UK, and you’ll be able to buy Mi Mix 3 through Amazon, eBuyer or direct from Xiaomi online at the UK Mi Store or in store at its Mi outlet in London’s Westfield shopping centre. – Display- The Mi Mix 3 comes with a 6.4-inch 2340 x 1080 Full HD+ OLED panel with an aspect ratio of 19.5:9 and a screen-to-body ratio of 93.4%. – Processor- The Mi Mix 3 is powered by the Qualcomm Snapdragon 845 octa-core processor and the Adreno 630 GPU. – Camera- The Mi Mix 3 has 4 cameras, two at the front and two at the rear. The back of the phone sports a 12MP Sony IMX363 with f/1.8 aperture, 1.4-micron and a 12MP Samsung S5K3M3+ with f/2.4 aperture, 1-micron pixels camera. It also supports OIS and 960FPS slow-motion videos with AI. There is a 24MP Sony IMX576 sensor with 1.8-micron pixels and a 2MP depth sensor with AI features on the front slider area of the device. – RAM and Storage- The Mi Mix 3 has 4 variants: 6GB RAM/128GB, 8GB RAM/128GB, 8GB RAM/256 GB and 10GB RAM/256GB. – Battery- The Mi Mix 3 has a 3200 mAh battery with 10W wireless charging. 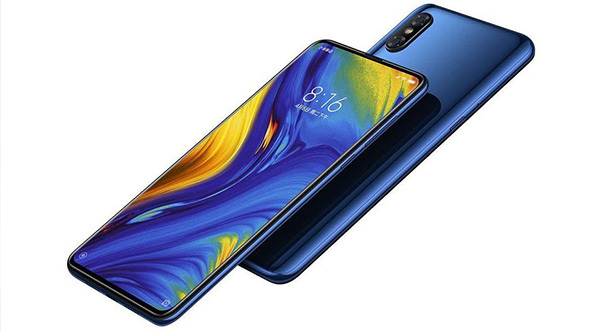 – Software- The Xiaomi Mi Mix 3 runs on MIUI 10 based on Android 9 Pie.